This morning, the birds are singing, the grass is greening and the scilla are in full, blue bloom. Scilla siberica, to be exact. This little flowering bulb reaches about 3" in height in my garden and it naturalizes beautifully. I have heard the word 'invasive' in reference to scilla but I prefer 'naturalize'. It does spread. That can be a positive. What makes one plant invasive and another a desired naturalizer? Well, this one has beautiful flowers of bright blue and they attract honeybees. It might crowd out grass but in my 'Freedom Lawn' that is just desirable. I do think its best use is as a naturalized ground cover. There is nothing as blue as the electric, black light blue of the scilla flower en masse. It blooms about the time of the daffodils and what could be better than that complement of yellow to enrich the tone of the blue or vice versa? Scilla is planted in the fall. Plan now to order some if you want your own carpet of blue. This is not a native bulb but then few are native to the USA. It is very hardy and it grows in Zones 4-8. The bulb contains a toxic substance so the deer do not eat it. That is a win around here. The bees however do love it. This plant is the first to bloom on which I see the honeybees. And, the honeybees have blue knees. Blue knees on the honeybees is a sight to see. They work the flowers as bees do and they end up with a nice cap of blue on their pollen baskets. I have long noticed the blue pollen but it was Kris Green, Interpretive Horticulurist and blog writer at Blithewold, who told me to look for the blue bee's knees. Persistence paid off. Yesterday was warm and windy and the bees were busy...well one bee was busy. I spent quite a while trying to get a shot of this busy bee. They move quickly from flower to flower wasting no time at all. I guess that is the definition of 'busy'. On my part, watching the bee was time well spent. I think there might be a children's story in that title, The Bee's Knees, what do you think? 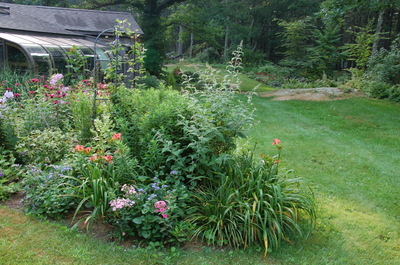 Okay, there is not a bee in sight in my garden here in the northwest corner of Rhode Island but that doesn't mean I am not thinking of them along with the birds and the butterflies and the flowers they love. The butterflies are also long gone but the birds are flitting about the cotoneaster and the bird feeders. I do have many bird houses about the garden and I have mason bees. They like to drill holes in the eaves of the house and the shed to lay their eggs. I really would rather they pick somewhere else to get this task accomplished. As a gardener and a nature lover I do sometimes receive gifts for birthdays and holidays which are meant to reflect my love of both. They are always appreciated. Any of these shelters from Gardener's Supply would be welcome in my garden. They are attractive as well as havens for some of the wildlife here. I was recently asked by Gardener's Supply to participate in one of their product giveaways.They sent me three wonderful, organic looking bamboo items. A bird house, a butterfly shelter and a mason bee house. 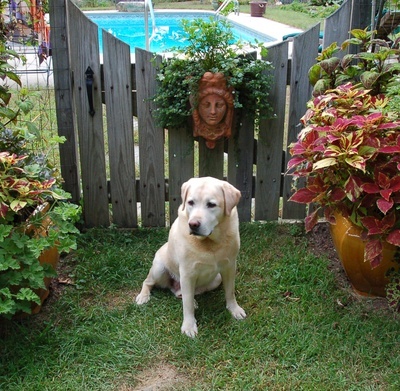 All are offered on the Gardener's Supply website and they can be purchased together or separately there. Do you have mason bees? 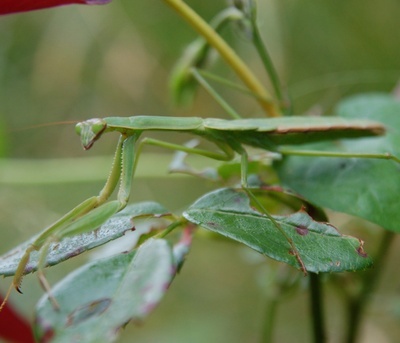 They are workhorses in the pollination department and many of the species are native to the United States. You can learn more about them here or here. I don't mind them when they are buzzing about the small, round openings they have created in my rafters. They are solitary creatures. I would prefer them to make their homes elsewhere. I have seen them burrow into the east facing wood and the west facing wood and some holes are under an overhang while others are just slightly recessed in a fascia board. With the help of Gardener's Supply, I am giving away some of the mason bee houses right here, right now. To enter, leave a comment below about the bees in your garden. Winners will receive one of these bamboo mason bee houses shipped directly from Gardener's Supply. You have almost a whole week to leave a comment but you must live in the USA and you must be over 18. Winners will be chosen at random on December 23rd. Make sure you leave your email address when you share a comment so that I may contact you. Note: Gardener's Supply sent me the three bamboo shelters at no cost to me and they will provide the winning prizes. Many thanks to them. I would also like to note that I have purchased directly from them on many occasions and they deliver with great customer support. Everyone seems to love hummingbirds except other hummingbirds. 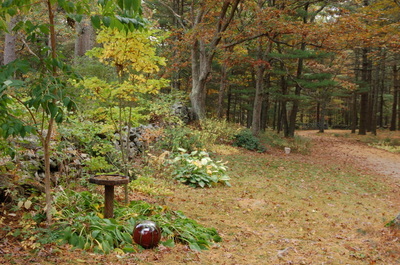 The porch in Maine is about an eight hour drive from Ledge & Gardens. It has three hummingbird feeders. Upon arrival the feeders were cleaned and filled with nectar for the birds which will shortly be traveling south. Porch sitting is a vacation necessity if you happen to have a porch and this one provides a beautiful view of Lake Seboomook in addition to the antics of the hummingbirds. One has to wonder why hummingbird feeders often have multiple perches for sipping nectar. Six females were observed feeding and fighting during the week. At one point for just a brief, shining moment I did catch three hummingbirds sitting and sipping. The shutter speed was fast which was a necessity for capturing this event. Most of the time there was much squawking and tweeting. Hummingbird's calls sound to me like a miniature Flipper. that clever, movie star porpoise. They are frenetic little birds, dipping and diving to avoid and chase the others away from the feeders. They do crash into each other now and again and the sound of those quickly beating wings colliding is a bit unnerving. None of them ever fell to the earth. They each seemed to pick a tree in which to perch. They sit and wait, barely visible due to their small size. When ready they zip straight to the feeder and, hopefully, get a sip or two before being chased away. Such a lot of wasted effort when there are often five feeding holes on each of the three glass feeders. Their very nature keeps them at war with one another. Enjoy this short video of their belligerent behavior. You know it is going to be a record breaker when the butterflies are flitting around the garden with you and your cup of coffee. They appear early if the temperatures are warm and today they were in abundant evidence. but I am not sure one side is better than the other. Next year I will put the vigorous sweet potato vine off to the right or the left rather than in the middle where it tries to take over and is always in center stage. Tomorrow the clippers are coming out. It needs a bit of training. The garden was full of life this weekend. I sat by the left handed mitten garden trying to get a shot of the hummingbird and the butterflies and much to my surprise, other creatures appeared. It was rather pleasant just sitting and waiting with the drone of the cicadas and the sounds of the birds in the background. It is hard for me to sit still for any length of time, just waiting although I am very good at taking a nap lying down. The hummingbird definitely knows when something is not in its' right place and it took quite a while to get this shot which, since I don't yet have telephoto lens, is not too bad. She is looking right at me while sipping the nectar. 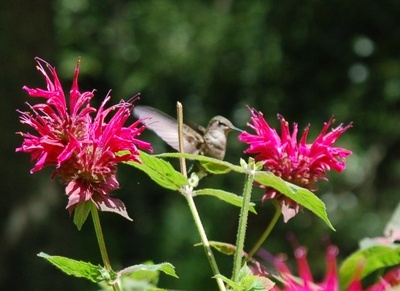 All I see in this picture is the stick of bee balm which should have been cut down to the two leaves. I'll do better next time. I did pick a few weeds while sitting in the chair and a slight movement in the center of the bed caught my eye. Someone else was lying in wait for a noon treat. 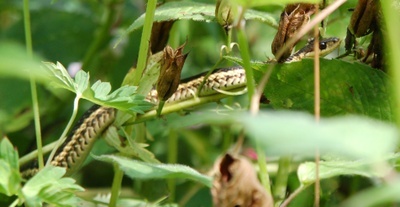 I know snakes are beneficial in the garden but I truly hate to be startled by them. This one is wrapped around the stem of a delphinium, long past. I did notice that the seeds should be ready for harvest although I wasn't about to reach in and grab them until this guy found another perch. The butterflies would seem an easy target for the lens with their gracefully arching drifting in the breeze but they are remarkably fast. I have found that it is better to wait for them to land and start feeding before you venture near. 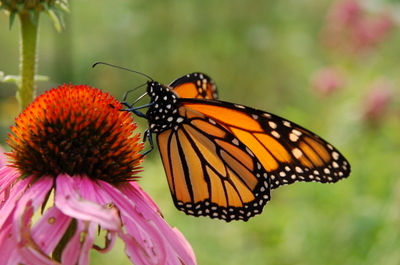 They do love the coneflowers and the butterfly bush flowers. 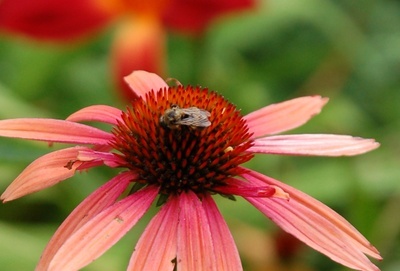 The bees also like the coneflowers and this one seems to be napping. 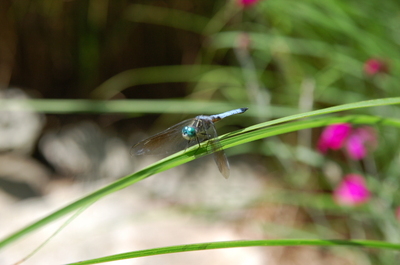 Over by the pond, the dragonflies were zooming about like helicopters in flight. They hover and lift like helicopters. 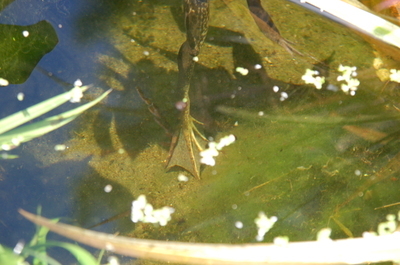 Then there are the frogs. I like the webbing of their feet and their incredibly muscular legs. No wonder they can jump so high. A day in the garden among the wildlife is a great day don't you think? The leaves are well past peak now and they are blowing everywhere! It was another busy weekend with little garden activity on my part at least. Coffee on Saturday morning with a view from the window yielded this scene. I have complained about deer eating everything in sight but this morning they were browsing on the plethora of acorns under this pin oak. Thousands of acorns were produced by this tree this year. 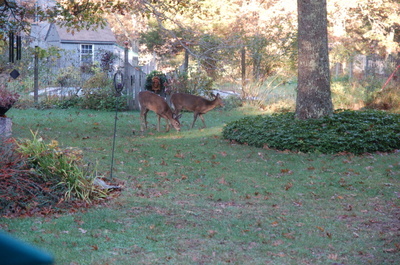 Deer love acorns. 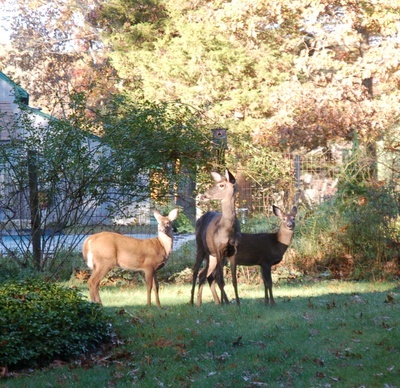 I sprayed the new shrub border just this past week so their attention was definitely on these nuts. I do love to watch these creatures but my goal is to keep them out of the yard and in the back field where they won't even be tempted by the perennials in the garden. I need to mix another batch of spray. I usually rotate the kinds of spray which I use. This last batch was Liquid Fence which, if you take a deep whiff, can actually produce that gag reflex which is so unwelcome. Once dried on the foliage it loses its' foetid fragrance. The next round will be Deer Stopper which has a pleasant clove like smell. I have read that deer have a scent gland between their toes. They leave a scent of fear or welcome depending on their experience. 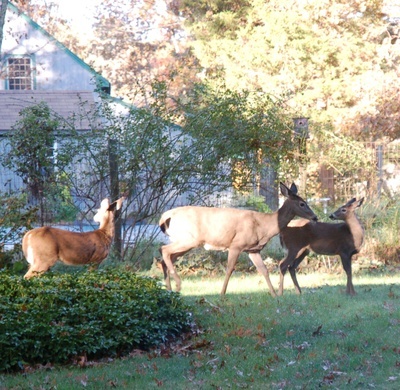 I would like to have them leave that fear scent which would warn the other deer to stay away. The job foreman is little threat to the deer. He will chase them to the wall line but he knows that they run too fast and who knows what he would do with one if he got close enough to touch it. 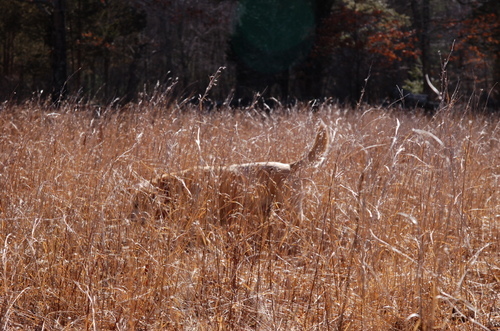 He often doesn't see them from his low vantage point but he will pick up their scent and race around with nose to the ground. It is a challenge to co-exist with these beautiful but destructive creatures. If only I enjoyed a good venison roast! Not my favorite meal so I will just continue to spray the perimeter and hope they find acorns elsewhere.